The similarities or difference between Wills and Trusts brings a lot of confusion for those in and out of the legal industry. This writeup intends to bring to fore the difference between wills and trusts. wills and trusts have been a term used interchangeably by novice and expert alike in the legal and quasi-legal industry. Did you think that wills and trusts were the same thing? It’s a common misconception, although it’s important to understand how the two differ so that you choose the most suitable option when deciding how your estate is to be distributed after your death. Here’s a summary of the main differences between the two, with further detail given below in an infographic produced by I Will Solicitors. Implementation: A will only comes into effect after you die; a trust is active from the moment that it’s signed. This means wills and trust are different as the former is activated upon death while the latter is activated before death. Property covered: Wills only govern property owned in your name; trusts can govern and distribute any property with which they are funded. 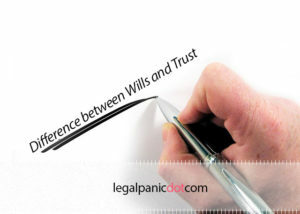 wills and trusts, therefore, cover difference range of properties. Probate requirement: A will needs probate for the transfer of property to a living beneficiary; a trust’s terms are considered adequate, so probate is not necessitated. Naming of guardians: In a will, you can name a guardian for your children. A trust does not allow for this. Naming of executor: In a will, you can name an executor who takes responsibility of the estate after you die. You can’t name an executor in a trust, although you can specify a successor trustee to manage the property involved in the trust. Publication: A will becomes a public document after your death, whereas a trust allows you to keep your affairs private.